We provide services that empower you to take control of your energy and save both dollars and emissions. We pair our energy intelligence platform with projects and services that together empower you to take control of your energy and save both dollars and emissions. Join us in the conversation about how to reimagine energy. On the splashy conference website, video imagery zooms energetically through the Vegas skyline, through spinning DJ’s and confetti, and hotel ballrooms packed with people. It promises technical deep dives on topics like the Internet of Things, alongside “quirky after hours experiences” like a wing eating contest and a 5k. Passes for the week cost $1,600. With our daily lives consumed by Netflix, Instagram, and Google Docs, you’d be excused for forgetting that merely a decade ago, there was no “global cloud computing community.” Though we’d come far in 2006 from the days when computers themselves filled entire rooms, our mounting mass of digital data and files had to be stored on expensive, physical servers—and the more files and storage needs you had, the more servers you needed, housed in warehouse-sized data centers built solely to keep and maintain them. Moreover, it was tricky to plan for how much storage you would need down the road, so companies inevitably paid in advance for storage that would be used far later, or sometimes, never at all—a cash flow complication that troubled everyone from small startups to large corporations. Even Amazon, the world’s largest online retailer, was struggling with the issue of scaling alongside hardware costs as they continued to build their business. When they created a technology internally that enabled them to store vast amounts of computer data without setting up hardware, they also recognized that if they needed that technology, so too, might the rest of the world. This is done from using a virtual data room platform make this solution possible. Yet tech giants of the word were slow to adapt to the ethereally-named “cloud”, as giants often are. They called the new service “crappy” and stuck to their known solution: expensive, but familiar data centers. 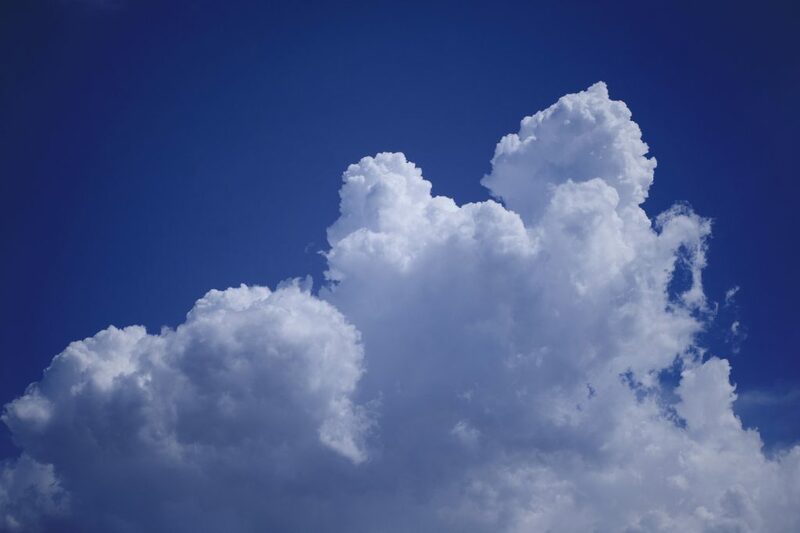 Instead, the early market for the cloud was startups—the tradeoff for reliability and what was a perceived lack of security being low-costs that enabled them to build and scale their businesses on bootstraps, acquiring data storage space as they needed it, versus paying upfront for a large amount of storage they might never use. You see, the tenant of a healthy ecosystem is that members of the system have equally important roles to play in their symbiotic relationship. So what happened this past decade was a revolution that fed on itself: AWS supplied a super-low-cost infrastructure, then continued to improve it, delivering value at a breakneck pace. AWS partners—both companies and individual developers—built services on top of the cloud, developing new business models in the Platform-as-a-Service and Software-as-a-Service. Their solutions made it even faster to build more new services, so stacking and layering of solutions accelerated the entire revolution. And it fed a “decade of lean, capital-efficient startups,” says Sam Lessin for The Information. “The intersection of good open-source software, infrastructure as a service [i.e. AWS], inexpensive distribution, and some plug-and-play monetization like Google’s AdWords or an app store put all the power in the hands of small technical teams.” AWS had created an ecosystem that allowed—no, spurred—innovation to thrive. AWS’s own growth looked something like this: in 2010, Netflix made the controversial move to build on top of AWS; in 2012, startup DeepField Networks analyzed anonymous network traffic in North America and found that one-third of those millions of users visited a website built on Amazon’s cloud infrastructure each day; in 2014, the CIA moved a large part of their computing demand to AWS (beating out IBM, whose wide use within the U.S. government didn’t make up for a less-impressive cloud offering at the time). In 2016, AWS’s collection of customers has expanded to include Intuit, Time Inc., Juniper, the Guardian, and Hertz. Last year, AWS was estimated to have a public cloud ten times larger than its next 14 competitors (including IBM, Google, and Microsoft) combined. The continued partner growth for AWS has propelled it to hit $2.57 billion in revenue in Q1 2016, and become the biggest source of Amazon’s overall profits. But now, in 2016, with cloud infrastructure folded into the fabric of the internet, business, government, and our lives, what’s next? Says Lessin, “Open-source software and infrastructure as a service will remain cheap forever. But the low-hanging fruit of highly scalable software startups has mostly been eaten. Why are we talking about this? We kid. No, it’s because this essential idea—that of infrastructure supporting an ecosystem of low costs and innovation—is no less true in energy right now. 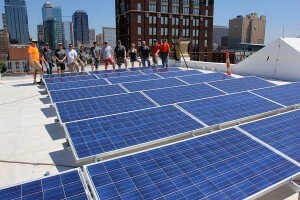 Brightergy has been in the solar generation game since 2010 and we’ve watched our clients—both for- and non-profit—grasp the growing accessibility of choice and control over their own energy use, by generating a portion or all of their needs on-site, usually employing financing as a means to either remove upfront costs or greatly decrease years to payback. Next, LED lights and other efficiency technologies became attainable in cost, and when paired with sensors, energy consumption due to lighting (the largest source of electricity consumption in the U.S. commercial market, according to the U.S. Department of Energy) can be tracked, measured, and controlled, alongside other business metrics. We’re now at a point where it’s possible to start building an energy strategy by tracking energy data in real-time with energy management software, and then use insights gained from those analytics to invest in projects and services that reduce energy consumption, then add on-site generation. This is a shift in the role of energy from cost—a bill that’s paid at the end of the month, with no control over the amount—to an asset. It’s also a shift with an intersection of its own: the growth of the cloud, and subsequently, the Internet-of-Things—devices that can monitor energy consumption on breaker boxes, lights, plugs, and more and then report that data over the Internet—and rising energy consumption and costs. Traditionally, energy companies have been large and slow-moving. Their infrastructure—power plants, substations, “poles and wires,” etc.—is now vast and aging, requiring more and more capital to upkeep and replace, which in turn, is contributing to rate increases. Many utilities are heavily regulated, and are also compensated for the amount of infrastructure they build—a holdover from when we were first accessing electricity in our homes and businesses, and the industry was building its own economies of scale. And then there are the challenges of adapting to new and emerging technologies and their collective influence on the grid. 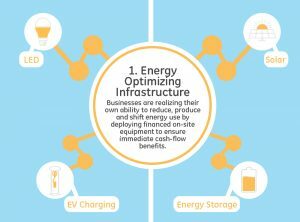 As the utility industry looks to figure out what the next business model will be and how they’ll get there, a window has opened to companies, new and old, who cater to helping other businesses reimagine energy as something to be managed strategically. Similarly to the cloud revolution spurred by Amazon and AWS, to keep moving forward towards escape of the electricity-as-simply-a-bill-you-pay mentality, energy will need to grow the symbiotic relationships born from larger companies providing accessible infrastructure that in turn encourages smaller and nimble companies to innovate and build on top of it. The idea builds on the as-a-service model brought forth by AWS and the cloud: simple, scalable, easily-updateable solutions that lower costs to its partners and shift the maintenance burden to the provider. “Supplemented by the Industrial Internet [Internet of Things], energy-as-a-service helps the enterprise continuously improve energy management over time with new sensors and software to meet changing needs—and companies can pay for that service on an ongoing basis based on use, instead of committing to an array of technology capabilities that might not meet long-term needs,” says Sylvester. With the right mix of partners, large and small, and the right infrastructure, the possibilities are imaginatively endless. 2019 © Brightergy. All rights reserved.